Local peaches are ripe and ready for use in these tasty treats. Local peaches are ripe, delicious, and ready for baking into these three easy upside-down cakes. The local peaches I’ve tasted this summer have been incredible — smooth, almost creamy, sweet flesh with a subtle halo of tartness. I’ve eaten a ton of them fresh, made some ice cream and peach lassis, and now I’m into the baking phase. While I’m good for just one peach pie per year, peach cakes are less work, so I turn out a few. Here are some of my favorite combinations--pecans in one instance, oatmeal in another, and cornmeal with lemon in a third. In a medium bowl, toss the peaches with 1 tablespoon of the granulated sugar and a pinch of salt; scrape them into a strainer set over a bowl and drain for about an hour, gently shaking the strainer to drive off juices once or twice during that time (peaches should give up about 3 tablespoons of juice). With the rack in the middle position, heat the oven to 350 degrees. 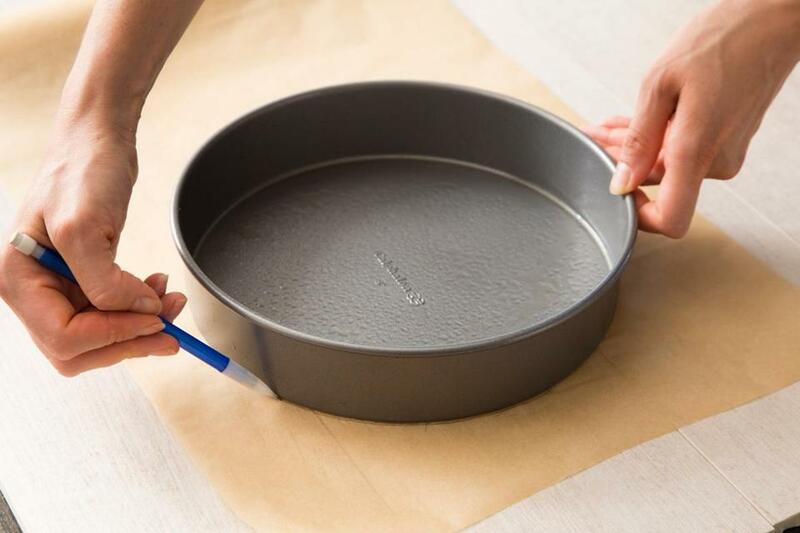 Spray a 9-by-2-inch nonstick round cake pan with nonstick baking spray, line the bottom with a round of parchment paper, and spray the parchment. Pour the melted butter into the pan and tilt it to cover the bottom; evenly sprinkle the brown sugar over the butter, and arrange the peaches in a circular pattern (leave a little space between them). Sprinkle 1/2 cup of the pecans between and over the peaches, and set aside. Pulse the remaining 3/4 cup pecans and 1 tablespoon of the flour in a food processor until the pecans are ground, four or five 2-second pulses. Add the remaining flour, baking powder, baking soda, nutmeg, and 3/4 teaspoon salt and pulse to combine. With a hand-held or standing mixer (fitted with the paddle attachment), beat the room-temperature butter until creamy, about 1 minute. Scrape down sides of bowl, add the remaining 1 cup granulated sugar, and beat on medium-high, scraping bowl as necessary, until butter and sugar are fully incorporated and mixture is very pale and creamy, about 3 minutes. Adjust the mixer speed to medium and beat in the eggs, one at a time, then the vanilla, until fully incorporated. Adjust the mixer speed to low, add one-third of the dry ingredients, and beat until incorporated. Add half the buttermilk and continue beating until incorporated. Repeat the sequence with the remaining dry ingredients and buttermilk, ending with dry ingredients, and beat just until batter is well blended. With a flexible spatula, give the batter a final stir to make sure it’s thoroughly combined. Scrape the batter into the pan, gently spread it to the edges, and smooth the top. Set the pan on a baking sheet, and bake until cake is golden brown and a toothpick inserted into the center comes out clean, about 45 minutes (do not overbake). Transfer to a wire rack and cool for 10 minutes. With a paring knife, gently cut around the perimeter of the cake to loosen it, and invert the cake onto a wire rack. Peel the parchment paper off the peaches if necessary and replace any of the peach pieces stuck to the bottom of the pan. Cool cake to room temperature, slice with a serrated knife, and serve. Unless you buy precut rounds, the easiest way to fit the parchment is to trace the outline of the pan onto the paper. 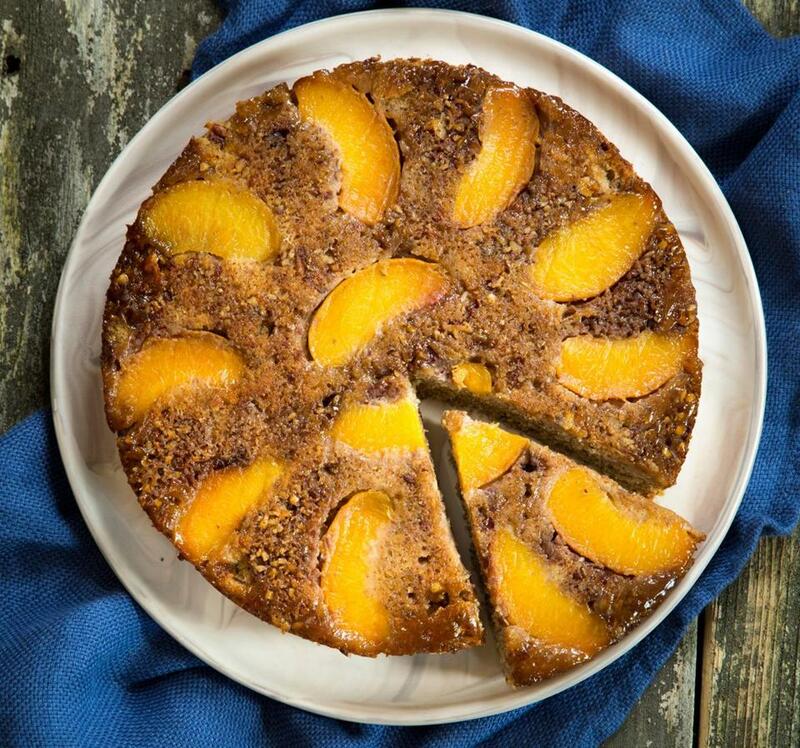 Note that the 1/3 cup of brown sugar in the batter is in addition to the 3 tablespoons of brown sugar used in the peach topping. 1) Increase the peaches to 1 1/4 pounds (about 3 medium), and arrange the slices in a tight circular pattern. Omit the pecans in both the pan and the batter. 2) In a small skillet over medium heat, heat 2/3 cup quick-cooking oats, stirring and shaking the pan frequently to toast the oats evenly and to a shade darker, about 8 to 10 minutes. Pour the oats into a medium bowl and set aside to cool. Add the buttermilk, stir to mix, and set aside until oats have absorbed some of the buttermilk, about 10 minutes. 3) In a medium bowl, whisk the flour, baking powder, baking soda, 1 teaspoon ground cinnamon, 1/4 teaspoon freshly grated nutmeg, and 3/4 teaspoon salt. 4) Decrease the quantity of granulated sugar to 3/4 cup, and add 1/3 cup light brown sugar when creaming the butter and sugar. 5) After adjusting the mixer speed to low to add the dry and wet ingredients, add half of the dry ingredients and beat until incorporated. Add the oatmeal-buttermilk mixture and continue beating until incorporated. Add the remaining half of the dry ingredients, and beat just until batter is well blended. 6) Proceed with the recipe to fill the cake pan and bake as directed. The cornmeal provides subtle crunch and a rustic texture. Serve with fresh berries and a little whipped cream or ice cream. 2) In a medium bowl, whisk the flour, baking powder, baking soda, 3/4 teaspoon salt, and 1/2 cup medium-grind cornmeal, preferably stone-ground, and set aside. Omit the nutmeg. 3) Before creaming the butter and sugar with a hand-held or standing mixer (fitted with the paddle attachment) on low speed, beat the granulated sugar and 3 tablespoons finely grated zest from 2 lemons until fragrant, about 45 seconds. Add the room-temperature butter and beat at medium-high speed until the butter and sugar are fully incorporated and mixture is very pale and creamy, about 3 minutes. Adjust the mixer speed to medium and beat in eggs, one at a time, then the vanilla and 3 tablespoons fresh lemon juice, until fully incorporated (the mixture may appear curdled, which is fine). Adjust the mixer speed to low and proceed to add the dry ingredients and buttermilk as directed to finish the batter. 4) Proceed with the recipe to fill the cake pan and bake as directed.